In February 1915, Private James Brown of the Cheshire Regiment had a near death experience the like of which has been seen countless times since in Hollywood movies. In the village of Neuve Eglise, his battalion under intense fire, Private Brown was thrown from his feet by a shell blast. 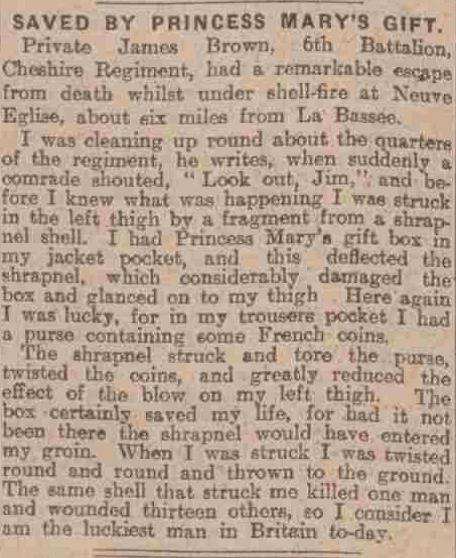 His life was saved by a small metal tin he kept in his pocket, without which he would almost certainly have suffered devastating shrapnel wounds to his leg and groin. The life-saving tin wasn’t just any old piece of metal. It was a Christmas gift sent to Private Brown by royalty. In 1914, the then 17 year old Princess Mary devised a scheme to ensure that every person ‘wearing the King’s uniform’ on Christmas Day 1914 received a Christmas present to remind them that the people back home had them in their thoughts. Since this represented in excess of 2 million servicemen and women, a fundraising campaign began in earnest. 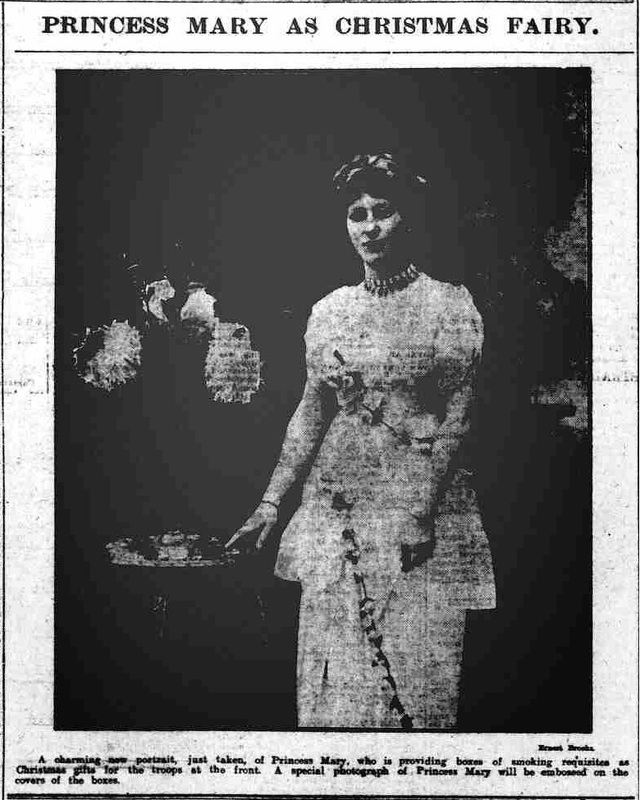 ‘Her Royal Highness the Princess Mary’s Sailors’ and Soldiers’ Fund’ was established in order to appeal for donations from the general public, with advertising being placed in national newspapers, fundraising events held all over the country and other appeals to the patriotism of the time and concern for the morale of the troops abroad and at home. It was decided that the gift should be a brass tin, embossed with a silhouette of Princess Mary’s profile. Written beneath her image was ‘Christmas 1914’, and in each corner a different Allied power. The logistics of producing over 2 million brass tins were incredibly complex. Brass was an important metal for the war effort, and so its availability was scarce. Large quantities were bought from America, and later in the war a shipment of brass destined to become Princess Mary Tins was lost when a German U-Boat sank the Lusitania off the coast of Ireland. Logistics notwithstanding, production began in 1914, and the first troops received their gifts by Christmas Day. The tins contained a number of small gifts aimed at boosting the morale of the recipients. Smokers received tobacco and cigarettes, non-smokers a bullet pencil writing case. Nurses received chocolates. Each and every box received that Christmas contained a Christmas card and a photograph of Princess Mary. After Christmas, the cards would read ‘Happy New Year’, but all of the boxes produced would hold an image of the Princess inside. The Sailors’ and Soldiers’ fund would continue its work throughout the War, before being disbanded in 1920. Over 2 .5 million Princess Mary Tins had been produced and delivered to grateful recipients, each one a reminder that those serving their King and Country had not been forgotten by those they protected. 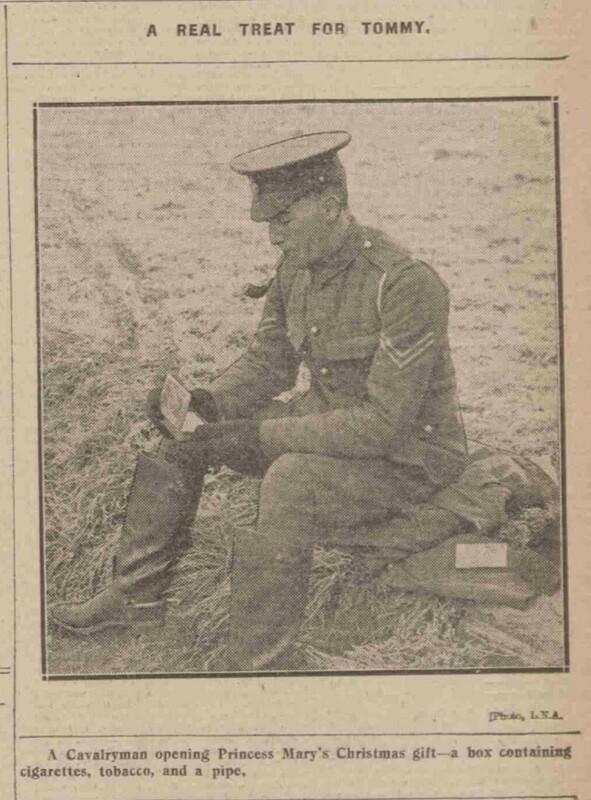 Do you have any ancestors who took part in World War 1? Explore their stories with our military records.